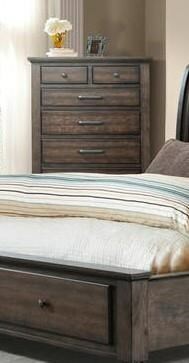 Complete your warm and welcoming bedroom with this chest. The piece features great drawer space for your clothing and accessories, while the tall and thin shape takes up minimal floor space. A Gray finish puts the final touch on this sophisticated storage piece. The Chatham Gray Six Drawer Chest by Elements International at Great American Home Store in the Memphis, TN, Southaven, MS area. Product availability may vary. Contact us for the most current availability on this product.